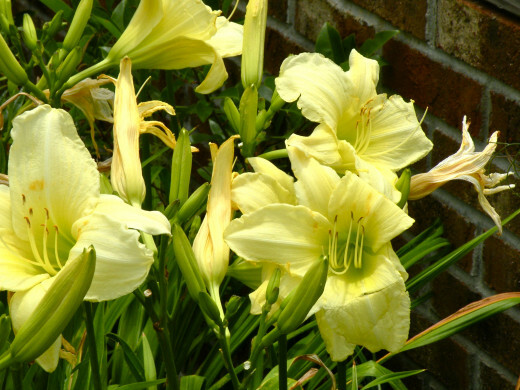 Eastern North Carolina, with its mild winters, high humidity and hot summers has good growing conditions for a number of beautiful summer flowers and plants. In my previous article, Spring Flower Pictures from a North Carolina Garden, I featured photographs of early spring flowers. As my garden progresses into its summer bloom, vibrant canna lilies, spectacular blue hydrangea and an abundance of day lilies grace my garden walls. Our small lot in North Carolina was nearly devoid of flowers and trees when we purchased the house five years ago. There were several walls that were intended to be foundations for an added room and an attached garage, but construction was abandoned by the previous owners. With no plans to continue the building projects, I decided to recycle the foundations into a patio enclosure and a backdrop for new flower beds. Now, four years later, my perennial gardens are well established and provide much enjoyment. 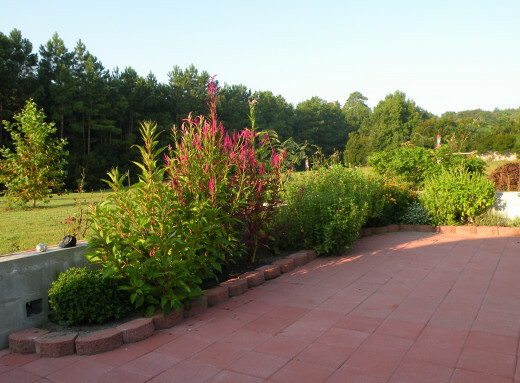 Summer flowers bloom on both sides of the patio enclosure as well as along the other brick faced walls providing splashes of color around the house. Now, I'd like to take you on a tour of the summer flowers along my garden walls. 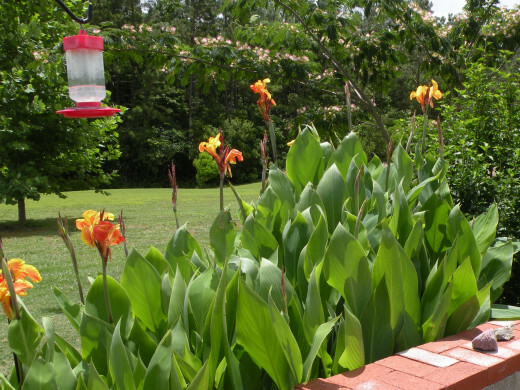 Canna lilies are perfect wall plantings. Their big showy leaves look wonderful from both sides of the wall, and the tall flower stems make the flowers visible from inside the house. 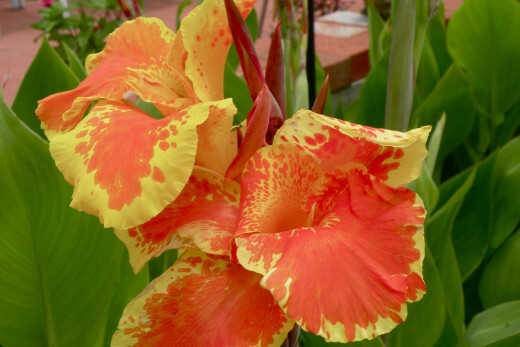 While canna lilies can be found in many shades of orange, yellow and red, ours orange cannas have spread most quickly. Each fall I cut back the foliage to ground level when the plant is finished for the season to keep those pesky leaf rollers under control. Lilies seem to like my garden walls, and do very well despite the heat of summer. These seem to be fairly disease and pest resistant. 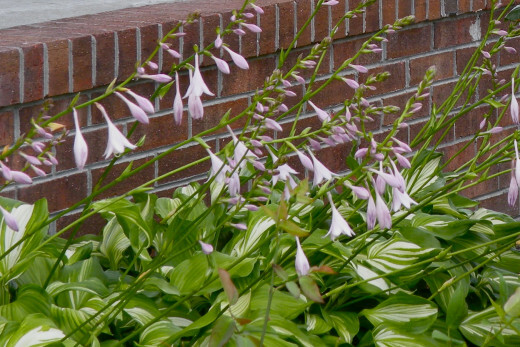 They produce a profusion of tall flowers that keep on blooming and are visible on both sides of the wall. These deep blue hydrangeas are among the most spectacular of my early summer flowers. I planted a small potted hydrangea only four years ago, the bush is now over five feet tall and is covered with extra large flower balls. 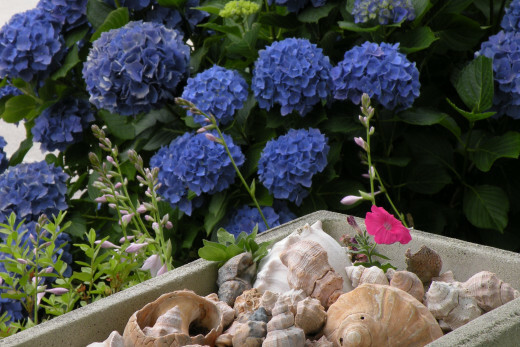 They make a beautiful backdrop for the pink roses planted nearby and for our favorite rock and seashells. I can never resist the boxes of annuals blooming in the garden center. A six pack of begonias is a bright ground cover near the base of a camellia bush by our side door. 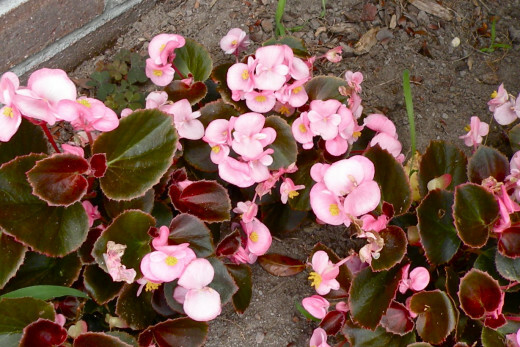 Begonias do very well in the shade, and each little plant spreads out and blooms continuously throughout the summer. 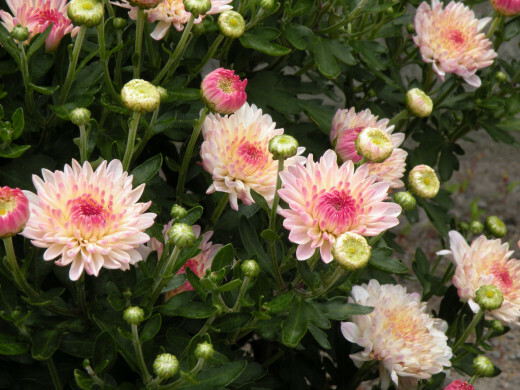 I often purchase pots of chrysanthemums in the fall to decorate my house or front porch. Later, these are planted in my flower beds and become part of my perennial garden. Although I expected them to bloom in late summer or fall, they sprouted early and were in bloom by June. When the flowers are finished, I will cut the plants back to encourage another bloom. The hostas that now line the foundation along our wrap around porch were once only two large plants. 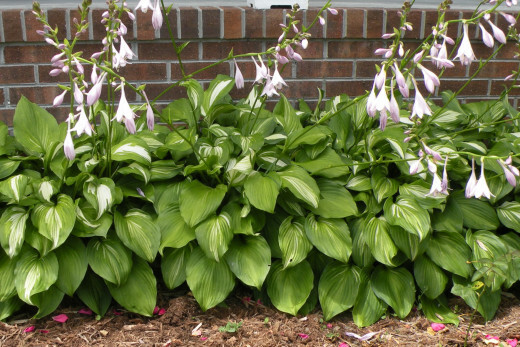 Hostas are easily propagated by division of the roots, and there is now a beautiful border of hostas along our porch. These variegated leaf hostas produce a tall flower stem with delicate lavender flowers. They add a delicate airy touch to the border. Living near a small wooded area and close to water, we often encounter different kinds of turtles. One day this little box turtle visited my garden. While box turtles are usually shy, this one looked at us curiously while I photographed him. I loved the way his yellow markings showed up in the sun, and enjoyed getting a close-up of his scaly looking skin. Animal lovers, never fear! When our short photo session was over, we carried the turtle to the edge of the woods where he would be safe. It's a pleasure to capture these summer flowers in photographs when they are at their best, at the peak of their blooming season. 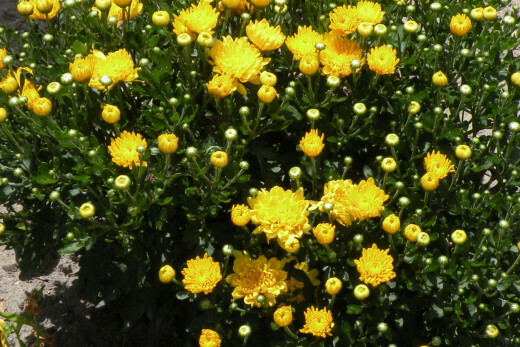 Often our peak blooming season is short-lived because extreme summer heat, heavy rain or wind will adversely affect the garden. I do hope you've enjoyed these moments in my summer garden, and that you will be inspired to go out and enjoy your own garden; perhaps you too will preserve some of summer's beauty with your camera or sketchpad. This article and all photographs are copyright by Stephanie Henkel ©2012. Please do not copy or use without permission. You have quite a garden. My pleasure, Stephanie. I'm thinking of doing a late spring container garden for my patio this month, if only I can get started. You're welcome. Thank you Kristan. This is the time of year when my summer flowers begin to bloom, and I derive so much enjoyment from them. In fact, it must be time to cut a fresh bouquet of roses for the dining room table! Thanks so much for you comment! Wow, stunning blue hydrangeas and nice lilies. All mine have died out, I think grubs in the soil feasted on the bulbs! This hub should whet the appetite of would be gardeners to go out planting! Beautiful flowers, Stephanie. This was a lovely hub with beautiful pics and lovely descriptions. Voted up for beautiful! Nice images. And so many of them. ChitrangadaSharan - I'm so glad you enjoyed my flower photographs! A beautiful garden is a joy, and I love sharing it! Thanks for stopping in to visit my hub! Wow! What a lovely garden! I loved all of them and scrolled down several times to see the lovely flowers. Gardening needs passion and the results are here to see. Just beautiful! Excellent pictures too! Thanks for sharing! Teaches1234 - I've been watching for that turtle, but haven't seen him again. He was awfully cute. I also love the begonias. 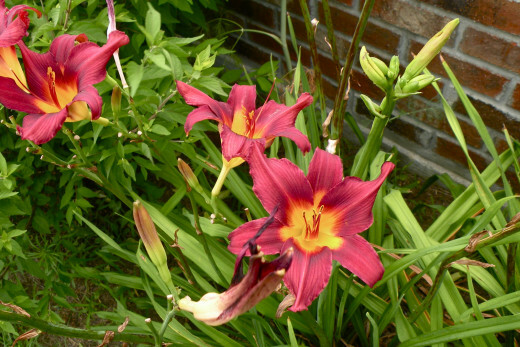 They add a bright spot of color in some very shady areas, and take very little care. Lovely flowers. The turtle was so cute. I think the begonias are especially pretty in any yard. Kudos for the beautiful recycling job. I am also a Carolina girl, and used to live in the eastern part of the state. 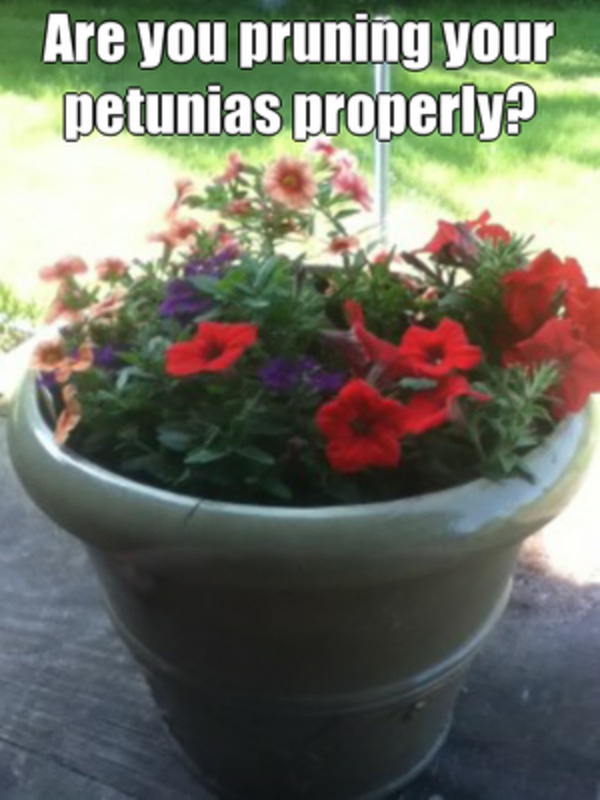 Maybe plants I had there made it through the winter - like begonias. Now I am in central NC and gardening is a bit harder, but I still enjoy the flowers in my yard. Thanks for the tour of your garden. Beautiful garden! I wish I had your green thumb and your love for gardening. Does the turtle still come and visit? He's so cute! Thank you for your comments, Thelma Alberts! I'm glad you enjoyed my photographs of my summer flower garden! Vellur - Thank you for your comments. I very much enjoy growing and photographing flowers, and I love to pick them to enjoy indoors, too. Glad you enjoyed! Awesome!! The photos are great, it must be wonderful to see all the flowers. Your garden must be so beautiful and not forgetting the fragrance of flowers. 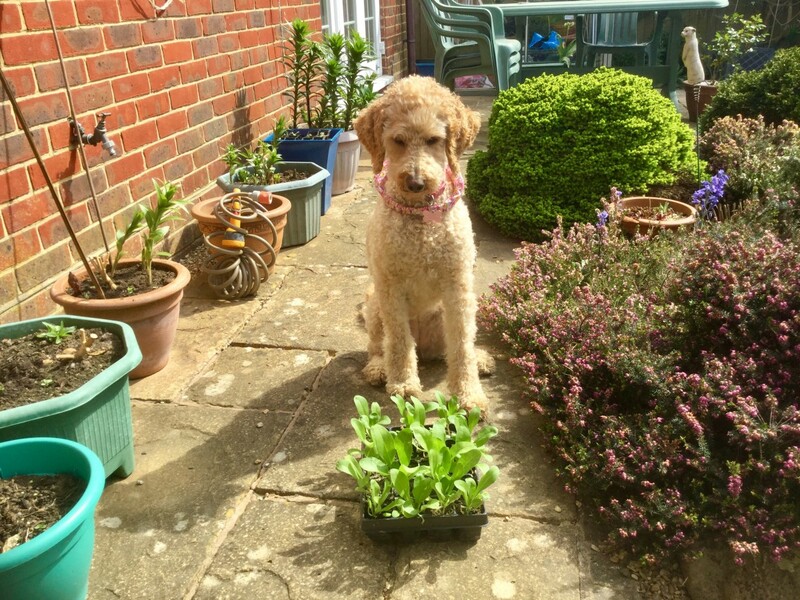 You are very good at growing these flowers. Voted up. Joanne M Olivieri - These blue hydrangeas are the first ones I've ever grown, and I certainly derive much pleasure from their beautiful display. Glad you enjoyed them, too! Thanks so much for your comments! Tillsontitan - Wow! Your comments make me blush! :) Thanks so much for stopping in. I'm so glad you enjoyed the photos and tour of my garden. Barbara Kay - I'm so glad that you enjoyed my photographs. It won't be long before Michigan is in full bloom, too! :) Thanks for stopping in to comment. Thank you so much Mary. This is a wonderful time of year here in eastern North Carolina as spring flowers overlap the summer blooms. Thanks for the comments and share! What a fantastic hub. I always love seeing blue hydrangea as they are rare around here. 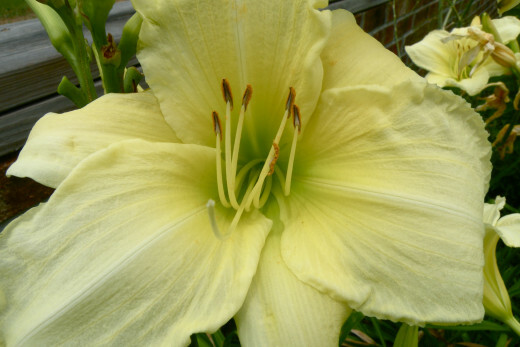 I adore lilies of all kinds and your photos are really spectacular. Voted up! Amazing, incredible, stunning, awesome, beautiful! And yet there's more. Your garden is all of these things as are your pictures! Can we get you a job with NatGeo or Better Homes and Gardens? Just breathtaking. Those are beautiful photos. We only have our spring flowers out here in Michigan. I can't wait until everything starts blooming. What a beautiful garden you have. I know how proud you must be. Most of these beauties don't grow in S. Fl. and I miss them. I grew all of these when I lived in Georgia. One of the great benefits of growing your own flowers is being able to pick a bouquet for your home all season long. Do enjoy your flowers indoors and out! You have just started me thinking of making a bouquet! Thanks for sharing this article and lovely pictures, Stephanie! Moonlake - You are welcome to visit my garden any time! :) I'm sorry that spring is late in showing up in your area, but I'm sure you'll be seeing crocuses and daffodils soon! Glad you like my new picture- thank you! Stephanie...You obviously have the much-wanted "green thumb." Your garden is lovely and so enjoyable to view through your photos. I love hydrangeas, but tried several times to grow them, to no avail. There's too much sun all over my front lawn, but I may try them again behind the house. 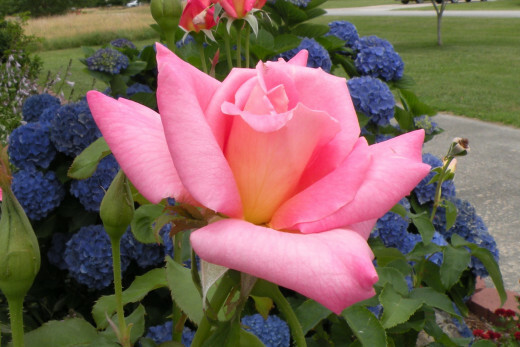 I'm trying some new roses--always looking for the most disease-resistant and the type that "self-cleans" to cut down on the need for deadheading. I came back to look at your garden. I needed it all I'm looking at out our window is dirty snow. Beautiful hub shared. I like your new profile picture. CrisSp - I'm so glad you enjoyed the photographs and the virtual tour of summer! Thanks so much for your comments! AudraLeigh - I'm glad you had a little reminder of summer as you read my hub...here in North Carolina, some of my flowers were still hanging on through Thanksgiving! I haven't seen that box turtle again, though. :) Thanks so much for sharing my hub, and thanks for your comments. It's always good to hear from you! This is a great article and the photos are so beautiful. I can't wait for spring and summer to come. Fall is fine but I'm not much of a winter person. I'd like to vote lovely, but there's none. So, I guess up and beautiful will do. I used to live in S. Carolina, and we grew the same flowers as you. Here in S. Florida we don't have the hydrangeas and the lilies among others. I can sure grow a Rose, though. Now that is November, I wonder what you have growing?? I voted this UP, etc. shared and pinned you beautiful Rose. I so love your flowers that are so plentiful there! It reminds me of how much I miss summer. But, my favorite pic was entitled, "This box turtle was checking us out "...what a cutie and great capture!!! Hope you are well...hope to talk to you soon! Moonlake - I'm so glad you enjoyed the virtual tour of my summer flower garden. Thanks so much for your comments and votes! Your flowers are just beautiful. I love the turtle. Great pictures. Voted uP! ChristyWrites - Well, that little box turtle just meandered into our backyard, so I had to include him in my hub! Glad you enjoyed my garden tour! I had to read so that I could see how the box turtle fits into the picture! Literally :) I like the lilies. So nice to walk with you around the flowers and I only wish I could smell them! I vote up. Denise Handlon - The box turtle visited briefly, but I loved having the opportunity for a little photo shoot - he was definitely photogenic! Thanks for stopping by! Iamaudraleigh - I'm glad to have brought some extra color to your morning read today! Thanks so much for stopping by and for your comments! Joanveronica - I think that sometimes I don't notice the way certain plants contrast against each other until I photograph them...I do like the way the rose and hydrangeas complement each other, too. I read recently that the markings are different on each box turtle...you can tell them apart by their markings! Thanks so much for your very nice comments. I certainly do appreciate the share! Thank you! Movie Master - I'm so glad you enjoyed my collection of summer flowers. I also love the double orange lily ... I just realized that the colors in the box turtle are a nice reflection of the colors in the lily! It might be the subject of a painting some day! Thanks for your lovely comments! Hi Stephanie, thank you for sharing your wonderful garden and flowers with us, My favourite is the double lily, absolutely beautiful. How fabulous to have a turtle visit your garden, I loved his colours. Did I tell you I shared this out on FB, TW, Stumble and Digg? Loved it! Wow, wonderful article! The contrast of the deep pink rose with the dark blue flowers at the back is stunning! And I loved the turtle! We have one too, but the markings seem to be different! Our turtle lives in the house, he likes our stove and protests if it is not lit quick, quick! The whole garden is beautiful, congratulations! Voted up, awesome, beautiful and interesting. Also shared on FB, TW, Stuble and Digg. Have a good day and be happy in your garden! What a great colorful hub to read this morning! Great info on flowers here! I really like your visiter; box turtle! He/she was so cute! Voted up for fabulous!!! WOW WOW WOW...you have such a gorgeous garden there! Randomcreative - When this little box turtle showed up in our back yard, I was so pleased to take some photos of him to include in my hub. He is quite personable, isn't he? Thanks so much for stopping in to read and comment! I always enjoy seeing your flower photos! You have a beautiful mix of varieties and colors. How neat to get turtle visitors. You get some great shots of the box turtle. Ardie - Hahaha...I'm sure you don't kill everything you touch...:) Thanks for your nice comment. I love taking pictures of flowers and plants, so I'm sure I'll be posting more photographs soon! Oh what a shame! But I would never see a deer in my garden :o(, we are getting squirrels though and I think they're helping themselves to my strawberries. Grandmapearl - I don't know enough about the effects of weather on the hydrangeas, but I'm always delighted to have a spectacular bloom such as we had this year. It was fun to photograph and fun to share! Thanks for stopping in to comment and vote! Thoughtforce - Thank you for visiting my article on summer flower pictures and for your kind comments! Jools99 - We do have some of the unwanted guests, too. Just a couple of days ago, and deer wandered over to our vegetable garden and picked all the beans that were left on the plants! Dahlia Flower - I know what you mean! There are many times when I'm pulled in two different directions as I love to be outdoors, but I have many other interests that are indoors. Thanks so much for your comments! MazioCreate - I would love to take all the credit for my garden, but I'm afraid that I'm more the idea person and my lovely husband does most of the work! :) We both very much enjoy the colorful spring and summer flowers, though! Thanks so much for your complement and comments! Vinaya Ghimire - Thanks so much for visiting my summer flower garden, Vinaya! Sgbrown - Thank you! Hydrangeas are one of my favorite flowers to cut and bring indoors for flowers on my dining table. I had planned to dry some of them, but the heat has faded the colors so much now that they've lost their intensity. Thanks so much for the read and for your comments! What beauty you have created with your gardens! Absolutely loved the hydrangeas. Mine were so nice last year, but this year have done nothing at all. I suspect it was the strange weather at work, especially the late spring heavy snowfall. But I'm not sure. Thanks for sharing all the gorgeous plants that surround you. Voted Up and everything. Your garden is so beautiful and every flower seem to be as beautiful as they could bee. The photos of the lilies are awesome! Thanks for charing your garden and for the inspiration! Voted up, and beautiful! Stephanie, beautiful flowers and great photos. 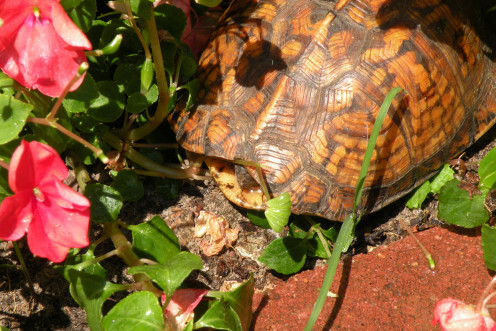 I love your photos of the box turtle - we never get guests in our garden (only unwanted ones!). You have such a beautiful garden. I don't have the courage to garden among all the bugs, but I did, I don't think I'd ever spend time with hobbies in the house. It must be so nice to be outside gardening when the weather is mild and the sun is shining. Thank you for sharing this tour of your gardens. It's just like a magazine layout. I especially like the red against the blue. Stephaine, these pictures are wonderful! I love your blue hydrangeas! 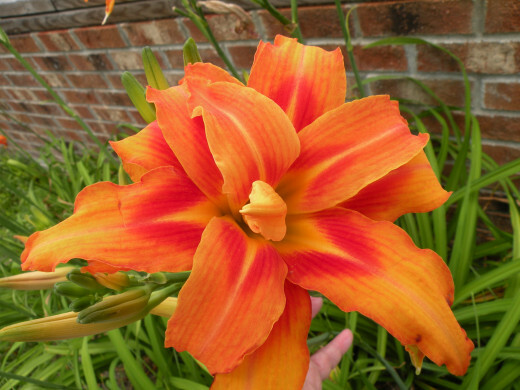 I have many orange lilies too, it's too bad they don't last longer than a day. You have a beautiful flower garden! I loved your pictures and the box turtle too! Up and beautiful! Janine Huldie - Thank you Janine! 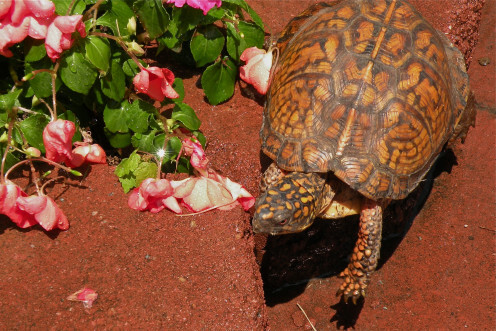 I love sharing photographs of my summer flowers and the box turtle, and I'm so glad you enjoyed them! 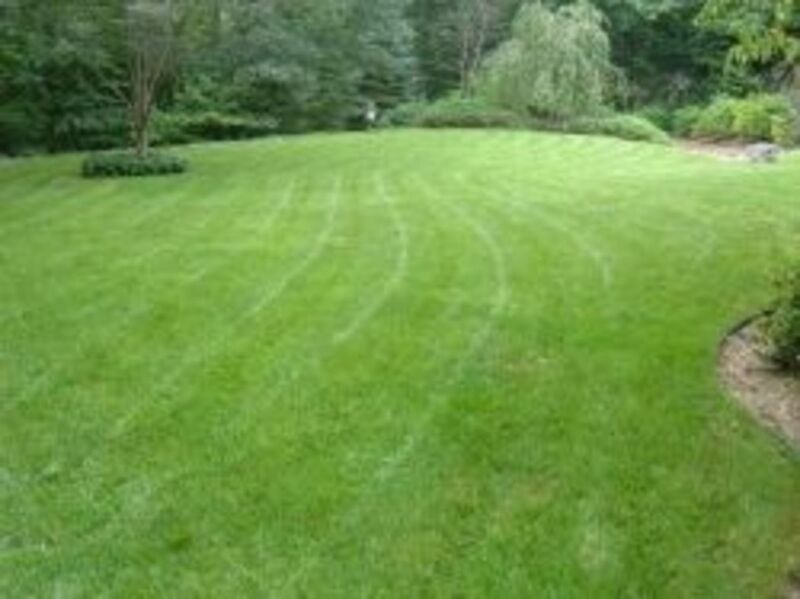 Wow, your garden is absolutely amazing and something I can only wish and dream to someday be able to do. The pictures really do make this hub by the way. Voted up and shared. Thumbi7 - I do love the deep blue hydrangeas, and was delighted that the blooms lasted for weeks. My garden is definitely not a carefully planned palette, but I do enjoy the bright colors of my flower garden! Thanks for stopping in to visit and comment! Jackie Lynnley - Yes, we do have beautiful flowers in North Carolina! The best thing is that there is something blooming almost every month of th year! I noticed quite a few lizards earlier in the year, but since the heat wave, they must be hiding somewhere cooler! Sunshine625 - What a sweet thing to say, Linda! I'm glad that my summer flower pictures and curious box turtle brought you enjoyment! Thanks so much for your nice comment! Davenmidtown - Thanks so much for your nice comments, Dave! I was quite taken with the box turtle, too. Sometimes I don't really see some of those wonderful details until I've taken a closeup photograph of the subject, and I was amazed at the scales and beautiful markings of the turtle. Don't we grow the most beautiful flowers in North Carolina? I don't think there is a more beautiful state. Love your turtle too, probably too many animals around me. I have noticed lizards are not around anymore either. Do you have those? I think they are so beautiful, I really miss them. Oh, I had a deep bowl of water out and the slugs are crawling in and drowning! Not a pretty sight but I will keep one there. The only thing I might hate worse than snakes! WillStarr - Thank you, Will! I do enjoy my summer flowers, and especially enjoy photographing them. Thanks for your comment! Xstatic -We also have a slug problem, but my husband has waged war on them. When we first had the problem, he would go out early every morning and collect them from the sidewalk and flower beds and destroy them by dropping them into a container of water mixed with vinegar and liquid soap. Some mornings he collected a couple of hundred! After a week or two, we only saw an occasional slug. This is the most cheerful hub filled with sunshine and beauty that I've seen all week. Thank you for sharing your garden with us. You obviously have quite a green thumb! The turtle is cool also! That was a close up shot...wow! Stephanie: Another beautiful hub! Your yard is spectacular and that box turtle is just beautiful. I enjoyed the cannas, though the entire yard is full of wonderful examples of flowers. The Hosta's are quite nice too! What a beautiful garden you have created! Up and lovely. Beautiful photos of a beautiful place that reflects much care and talent. Our Hostas seem to be the favorite food of voracious slugs. How do you deal with that? We use (animal friendly) bait, but snails and slugs proliferate (oh, a rhyme!). Up and more! 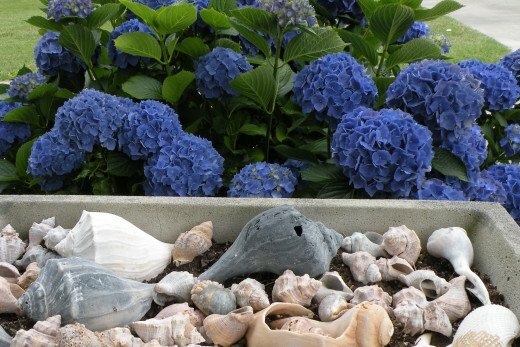 Rosie Writes - The soil near our foundation must be just the right acidity for these blue hydrangeas. They seem to do better when they have a little afternoon shade, too. Other than that, I don't do anything special to get them to grow. I do enjoy them now that they are growing taller and are visible from the front porch. Good luck with your hydrangea, and thank you for stopping in to comment! Hi Christin53 - We don't often see box turtles around, so it was a nice surprise to have this one exploring my flower bed. Glad you enjoyed my summer flower pictures. Thank you for stopping by to comment! 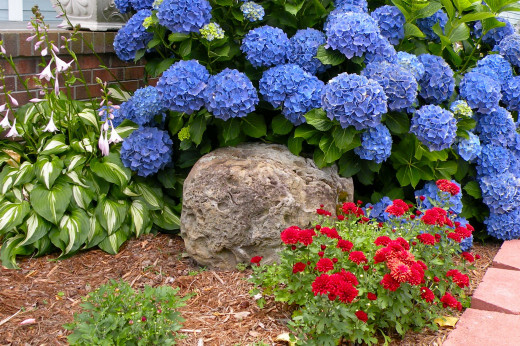 I am soooo jealous of your beautiful blue hydrangeas! I cannot even keep them alive. My latest one is staying in a pot for now so that I can keep a close eye on it. Wish me luck. Hi Gail, How nice to see you here! One thing I do love about living in the South is that everything grows so fast in this mild, humid weather! A sycamore tree that we got from an Arbor Day Foundation giveaway 4 years ago is now an unbelievable 20 feet tall! I wish I had documented it's growth! The exquisite rose drew me in and the rest of the hub and photos were just as beautiful. Can't believe how mature your garden looks after just four short years and I love the way you turned an abandoned addition into a peaceful, lovely patio. 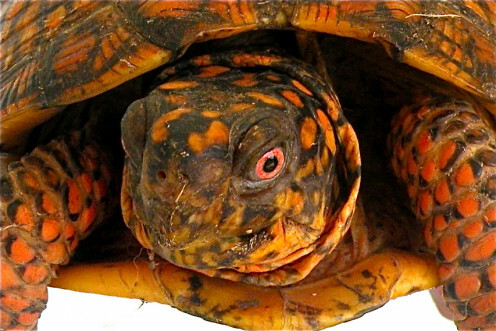 The close up of the box turtle's face is really cool!